Samantha is the brains behind our recent bike light donations to the Baton Rouge Police Department, and she's always enthusiastic about making sure that those who are new to bike rides have a good time. Her journalism experience has been invaluable in making sure Bike Baton Rouge gets its message out to the right people in the right way. 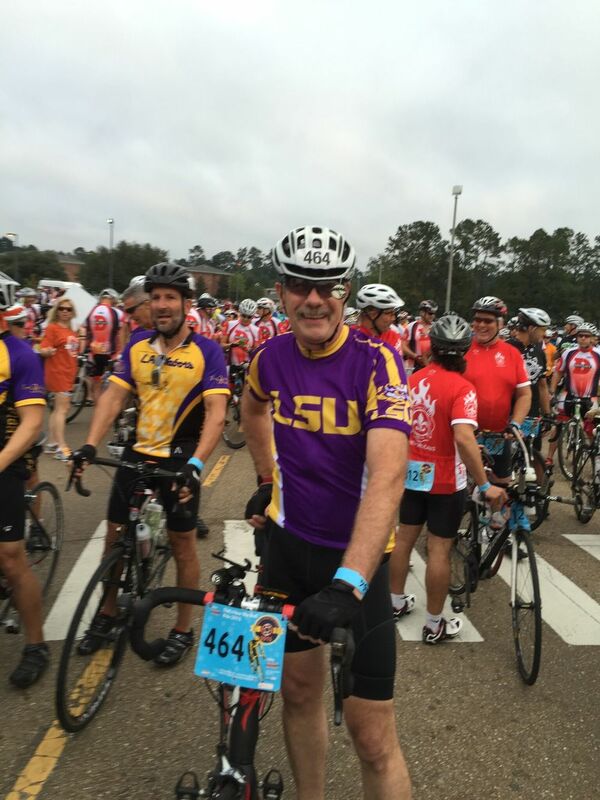 I seem to be a bit of a rarity among the bicycling community - I am a Baton Rouge native. My name is Samantha Morgan and I love this city. Sometimes I feel as though the city and I have grown up together. As a child the city seemed to be small and every year I have watched it grow. It's exciting to watch this place change and grow. About 2 years ago I went on a trip to Austin to visit my brother and friends. I stayed for a week with a friend who is an avid bicyclist and former Baton Rouge resident. One night we decided to go to a nearby Mexican restaurant for dinner. Seeing as how he had a stash of bikes, enough to outfit a small group, we decided to get there by bike. I was a bit anxious about it; I hadn't ridden in years, but the old saying is certainly true. There was a moment on that ride when things just seemed to click. When I got back, it took a couple weeks, but I ended up buying my first bike since college. I started riding around the neighborhood, then decided to try riding to work, which is only about 2.5 miles. Suddenly my life changed. At first it was hard, but I kept doing it and now it's the easiest thing in the world. Plus, I found that when I started my day off with that little bit of exercise, my energy levels became higher. Now I wake up at 5 am to go running before biking to work. One thing leads to another, and it was a bike that started me down a path to becoming a better version of myself. I've always wanted to get involved with a "group," but I just couldn't seem to find one to commit to. I work in media, so I looked at those types of membership groups, but none seemed to appeal to me. I am a painter, so I looked at those. Again, none seemed to fully capture my attention. Then I was asked if I would consider joining the board. Without hesitation I said yes. It was a no brainier for me. Joining the board was like going on my first group ride - I wasn't really sure about it, but from the minute I started the ride, I knew it was where I needed to be. As I just mentioned, I work in media, so I know people - a LOT of people. Too many people, really, but that is a good thing when you're trying to get things done. I enjoy getting information out there and getting the right people connected. Sometimes I feel a bit like a matchmaker, but instead of relationships, I create bonds that will get things done in this city. People who ride bikes on a regular basis tend to be very passionate about it. That passion, however, can be as positive as it is a negative. I think perceptions about bicycling will change over time, but until then, the greatest challenge for bicycling in Baton Rouge will be finding a balance between passion and patience. It's easy to identify the things that need to change, it's much more challenging to remain calm while waiting for that change to happen. The current board members are very focused on keeping things positive when it comes to bicycling. That doesn't mean we are ignoring the problems, the opposite, really. Rather, we are trying to find ways to address those problems in a way that will benefit everyone. For example, we want to make sure people on bicycles know the rules of the road and safety as well as the drivers. I'm particularly proud of our latest effort. Which is a partnership with the Baton Rouge Police Department to provide lights for bicyclists seen riding without lights. This program is meant to help bicyclists with free lights and information, as well as to hopefully reach drivers as well. We do not want to be a fist-on-the-table type organization, we just want people to be safe on bikes, period. I think we will progressively see more people on bikes, but my hope is not just to see bike culture improve, but also the car culture. As the city expands, the connection between ares will also improve, making it easier to get form one location to another without having to take a care. In 20 years, I hope people will no longer feel a need to drive 3 miles to work, or 1 mile to the grocery store. The infrastructure to make that all possible is already happening, people just don't know about it yet. Recently I had a random Friday off work. It wasn't a holiday, so I was excited to go do things that I need to do during regular business hours on a weekday. I mentioned to my plans to my dad and he said "it's a shame you have to run errands on your day off." I said, "I don't mind, I'm doing them on my bike, so really it's just an excuse for a bike ride." My ideal bike ride is one where I get to incorporate biking into my everyday life. Life moves so fast, if you don't slow down to enjoy it, you might only remember staring at the bumper of the car in front of you. Biking changed my life. I can't say it will do the same for you, but I can say for certain that you will never know until you try. But if you don't want to, that's totally understandable, just don't be impatient with those who have. Slow down, go around, and let's all get to where we are going safely.